Who is Nelly Toll and why is her story important? There are many paths to becoming an art therapist or counselor. As a School Psychologist I have heard many accounts about why people have chosen these fields of study and practice. So, when I learned about Nelly Toll – an art therapist AND a counselor who works with victims of violence – I was a bit taken aback. You see her biography reads like a book of fiction as Nelly was a counselor who as a child had survived the most harrowing of times. An artist who used her limitless imagination while forced in to isolation. A survivor of one of the worst atrocities to befall the human race – the Nazi era and WWII. A child who was with her mother was forced in to hiding for two years until she was able to safely get passage to the United States. And now the newest addition to my list of heroes. I have raised two creative kids – and I could not fathom either or both of them in seclusion – quietly – for two years. But, that is what Nelly Toll purportedly did. She used the deep burrows of her imagination to create a world of wonderment and normalcy in a world that made absolutely no sense to any adult – let alone an eight year old. She painted with watercolors on bits of paper and now her creations are telling a story that gives hope and inspiration to many. While I have known for decades about the story of Anne Frank, I am embarrassed to say this month is the first I have heard of Nelly Toll. So to get up to speed I did a bit of research and found this awesome website with learning tools for teachers. For Judaica teachers this would be a treasure trove full of information that gives balance to the story of the Holocaust – Shoah. Also, there are efforts to bring Nelly’s story as a documentary. 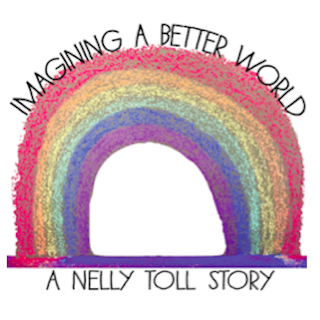 IMAGINING A BETTER WORLD, The Nelly Toll Story is a film that will be made shortly about how this young girl was able to be so resilient. Now this young lady holds a doctorate, campaigns for anti – bullying programs and is a sought after speaker. In this exclusive one-hour documentary, the viewer will travel with Nelly through her two worlds, as she leaps into her bright future, escaping her present living hell. Vérité cinematography and rare archival footage will be combined with visually stunning 2D & 3D animation of Nelly’s watercolor paintings. Virtual reality recreations will amplify the telling of Nelly’s time in hiding and her inspirational career as a teacher, counselor and art therapist after the War.